As some of you may know already, at Rhubarb & Roses we have been selling silk floral arrangements for some time – All our arrangements are handmade here in Winslow (Bucks) by our Floral Design Team. 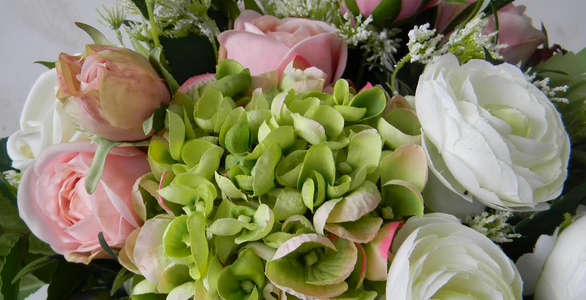 We select all the silk flowers and foliage’s by hand and choose what we feel is true to life. Our designs come from things that have inspired us, from places we have visited, to things we have seen and loved. 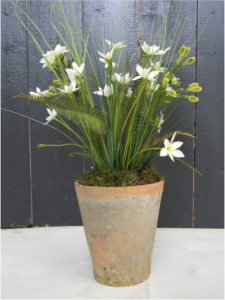 Earlier this year we were inspired by ‘The Chelsea Flower Show’ loving the tall grasses and wispy flowers such as Queen Anne Lace which inspired our ‘Meadow Pot’ arrangements . 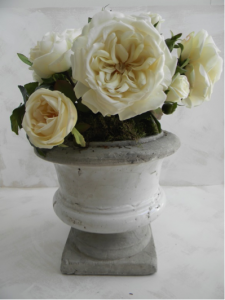 David Austen Roses never fail to amaze, so when we saw these beautiful cream silk ones we couldn’t believe how ‘true to life’ and identical these are to natural ones we’ve had in for weddings; Here we have arranged the roses in a cream coloured stoneware urn, also hidden amongst the roses are some green rose buds. 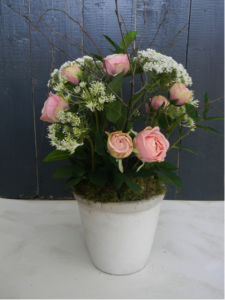 Another lovely silk arrangement with pink garden roses and Queen Anne Lace in a cream coloured stoneware pot. We like to incorporate some natural elements to our work, often finishing with real moss and adding structure to the arrangements with birch twigs. Watch this space for our autumn range of silk flowers and foliage’s. Dust off those vases and bring them in, you never know that old vase could look spectacular with an autumn floral display!